Bent plywood. Modern Lines. Ray and Charles Eames. What, this doesn’t sound like a kid-friendly post to you? It IS! Modern design has become so damn popular that now even our tots can get in on the action. No surprise with some accessory items, but how about an exact replica of the famous Eames LCW (Lounge Chair Wood) Chair? It’s a favorite of mine, most definitely. And apparently this modern design icon is a favorite of enough design-addicted parents to make a child-friendly version. I’ve seen other classic children’s chairs, including the child-sized 1952 Bertoia Chair, but that’s probably because it was originally made in a smaller size. Though I’m not sure being this design-obsessed is healthy, I’m still excited to see a selection of classic design chairs in one place, at Little Nest. 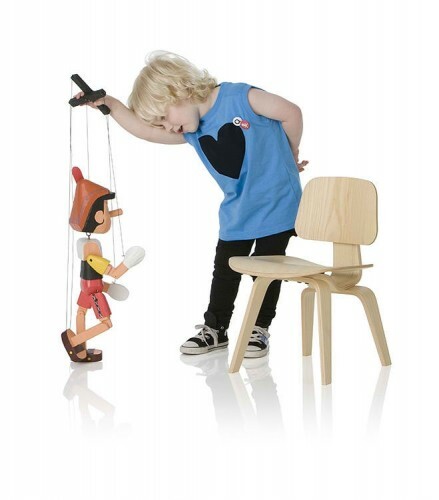 This is the funniest part though: it’s much more likely we’ll end up with the Child-sized LCW chair (in Ash, thank you very much) before we get an adult sized Eames chair. With my warped bargain sense, the $125 for the kids’ version makes it feel so affordable, compared to $679 for the adult chair! Somehow practicality is not part of the equation? I own the (grown-up) version in gorgeous red. This tiny one has me so smitten! I don’t have kids, but want it anyway! Would that be weird? A tiny chair in a grown-up only household? Heavens no! I can see it in a corner with a towering pile of books. Or pillows. Or … well, anything. Or , ha ha, sit it next to the big one as your “side table”. I can’t WAIT for your holiday gift guides. I rely on them for the Peach and other little kiddos in my life. BTW, Heidi my friend has a small vintage style trike in her house and she doesn’t have kids and people love it! Dottie, you are the sweetest! I’m madly working on them right now!!! Wish me luck, I seem to have an indecision-disease at the moment ….